Do you remember playing that game during recess or gym class where everyone stood in a line and ran towards their teacher when he yelled "Green Light" in an effort to get there before everyone else and then slammed on the brakes when barking out "Red Light"? Well, if this elementary game is a loose analogy for our last 19 months in Central America, we've been somewhat stuck in the middle: "Yellow Light!" We clearly hit the ground running on a green light from the Lord when we answered the call to come to Costa Rica. 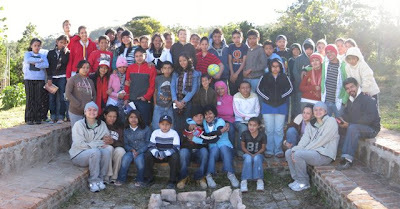 However, once we arrived our vision for Rancho Oasis 4 Youth has been on the awkward yield: unable to afford property, distracted by a full-time teaching job, learning how to parent two children under three years of age and ministering just once a week to the children in our neighborhood via Club de Ninos. All of this was to say that during our trip to Honduras, Marillyn and I received the Holy Spirit's "Green Light" for RO4Y. All of what we have prayed for in starting R04Y and more has been answered - and we are so excited! When we arrived on the property in Ojojona, Honduras there was this overwhelming sense of peace, excitement and notion that this was home. Our new home! Helping with Capilla Calvario's youth retreat helped us to see the potential for RO4Y. About 50 youth from three different churches attended the conference. (Tegucigalpa, Honduras' capital, Valle de Angeles - a community near Tegus, and Ojojona). It was a mix of city kids and country kids. Exactly the mix that we desire to serve. They all accepted Christ at the retreat! Ojojona is ideally located an hour from the capital. On one hand we desire to minister to the youth of the city by bringing them to a peaceful environment, away from the craziness of the city, to experience and learn more about God. Secondly, the surrounding community is teeming with need. We desire to initially start by continuing the work that our missionary friends in Tegucigalpa started by holding Bible studies Sunday afternoon. From there, because we will be living in Ojojona, the possibilities of ministering, helping and loving on the children and families are endless. The property itself is perfect and has a few buildings built or started. At the same time there is a lot of work to be done; which opens up the opportunities for missions teams to come and invest their time and labor into the ministry. It is so encouraging, almost unbelievable, to see the exact answer to the prayers that we've been praying for come to pass in the development of RO4Y! God is so good. Over the next few weeks, I'll be sharing more details about Ojojona and Honduras, but rejoice with us in this exciting new chapter for RO4Y! Praise for the opportunity to visit Ojojona and participate in the youth retreat. We had a wonderful time with our friends, Jason and Patty. Pray for all the logistics in our move to Honduras. Timing (we are thinking February of 2010), selling our possession in Costa Rica (from desks to our vehicles), how to get our "prized" possessions from CR to Honduras, and obtaining legal residency. Jon's parents are visiting for Christmas; pray for safe and blessed time traveling. We are also planning on handing out a bunch of clothes to children in our neighborhood; pray that we have opportunity to share Christ as well. We will be visiting the States from December 28th to January 19th. Our plan is to share in a few churches in Southern California, attend the Missions Conference, then visit friends and members of our support team in Seattle, WA. Pray for us as we plan and prioritize the work and ministry of RO4Y! Continue to pray for Jon's healing from the bike accident. The once dislocated finger is difficult to bend, he still has a lot of soreness on his shoulder and rib-cage and because of the weak condition of his right arm he tweaked his right wrist and is experiencing pain in his hand. The road rash is healing great, but the rest of the injuries have a way to go! This video was filmed while driving the Ojojonan children back to their homes after the Sunday afternoon service. Can you say BUS? WOW...PRAISE THE LORD!!! That's AWESOME!!! Glad to hear good news and things are getting there for you all. Plus it would probebly open up more doors for Wayne. There's always a reason for everything...and God's timing is always perfect. Miss you all and thanks for the update. I was wondering how it all went. I am actually crying tears of joy for what God is doing (and I don't do that!) What He has started. . .!! We think we will be back in La Ceiba for a month in July. My father in law will be there for three weeks in February. He's going to help the orphanage we work with make plans for their new facility. If you are in the area ever, maybe our paths will cross.